Large well equipped park in Hertford with 11 points of interest. Operated by Hartham Leisure Centre over the summer months. Visit the summer-grazed wet meadow to see a more traditional river landscape, alive with dragonflies and other invertebrates. Set on the edge of Hartham Common in Hertfordshire, Hartham Leisure Centre offers the local community a range of indoor and outdoor facilities. Outside there are a variety of outdoor sports available and a pavilion with changing facility as well as a six rink bowls facility. Inside you will find a gym, group exercise studio and swimming pool. The gym is stocked with the very latest fitness equipment including WattBikes and PowerPlates. The swimming pools offer our award winning swim school as well as a range of water based activities. In the group exercise studio you will find the very latest group exercise classes to provide members with a new challenge. Small non-charge car park in the middle of the site which is accessed over a small bridge leading from Marshgate Drive. This car park contains gated vehicular access to the eastern side of the site, but there are limitations on the size of vehicle that can gain access due to the weight limits of the small bridge. Work is now starting to redevelop the old tennis courts into two new floodlit 3rd generation artificial turf (3G) all weather mini football pitches whilst retaining one tennis court. Follow the winding path through the Warren Woodland to discover stunning views across Hartham Common and Hertford. Hartham Common is a well established open space with over 1000 years of recorded history. It is approximately 19.71 ha (48.7 acres) in size and located within only 5 minutes walk of Hertford town centre. The park has important access and ecological links with neighbouring sites, particularly through its river corridors. Hartham Common benefits from a range of facilities including a leisure centre and swimming pool, public toilet, two well equipped play areas, a skate park, football pitches, bowling green, tennis courts, trim trail, ample vehicle parking with CCTV, and extensive riverside and woodland walks. In the summer, refreshments are provided from a kiosk operated by the leisure centre and a variety of events take place throughout the year. In 2013, Hartham Common was dedicated as a Queen Elizabeth II Field in celebration of the Diamond Jubilee in 2012. The Queen Elizabeth II Fields Challenge was created to protect two thousand and twelve outdoor recreational spaces for communities now and for generations to come as a permanent living legacy of the Diamond Jubilee and the London 2012 Olympics. The dedication helps to reaffirm the importance of Hartham Common to the local community and to underline the commitment that East Herts Council has to developing and maintaining parks of a high standard right across the District. Hartham Common Pay and Display Car Park, SG14 1QR. Directions here. Further information including car park charges is available on the East Herts District Council website here. Close to Hertford Town Centre bus and railway stations. Free guided walk leaving from the bench near Hartham Leisure Ventre, Hartham Commom, Hartford, SG14 1QR. This walk is a Grade 3 (where 1 is easiest and 4 is challenging ) Refreshments will be available afterwards. The walk takes place at 2pm every Thursday. Alternate Sundays at 11am on the following dates: Jan 6,20 , Feb 3,17 , March 3,17,31 , April 14, 28. Also starts at 2pm on sundays on the following days: Jan 13, 27 , Feb 10, 24, March 10,24 , April 7 (No walk Easter Sunday) . If you can't make this Hertfordshire Health Walk, there are plenty of others to choose from. Details are available from the Countryside Management service website. Hertfordshire Health Walks This Hertfordshire Health Walk is part od a countrywide programme of free, volunteer-led walks, which aims to help people get outdoors, get more active and reap the benefits. The walks are all sociable and you don't need any special equipment to join in, just comfortable shoes, To register to walk either sign up online at the Countryside Management Service Website or just turn up a few minutes early for your first walk. The programme runs all year round and offers choice of different walk grades, start points and times, including weekdays and weekends or evenings in the summer. For more information and a copy of our leaflet please go to your local library, GP surgery or council office or visit the Countryside Management Service Website. Free guided walk leaving from the bench near Hartham Leisure Centre, Hartham Common, Hertford, SG14 1QR. This walk is a Grade 3-4 (where 1 is easiest and 4 is challenging ) Refreshments will be available afterwards. The walk takes place every Sunday on the following days: Jan 13, 27, Feb 10, 24, Mar 10, 24, April 7 - no walk Easter Sunday. If you can't make this Hertfordshire Health Walk, there are plenty of others to choose from. Details are available from the Countryside Management service website. 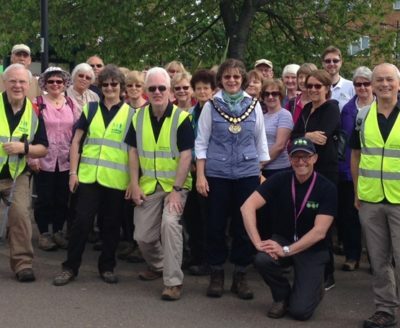 Hertfordshire Health Walks This Hertfordshire Health Walk is part od a countrywide programme of free, volunteer-led walks, which aims to help people get outdoors, get more active and reap the benefits. The walks are all sociable and you don't need any special equipment to join in, just comfortable shoes, To register to walk either sign up online at the Countryside Management Service Website or just turn up a few minutes early for your first walk. The programme runs all year round and offers choice of different walk grades, start points and times, including weekdays and weekends or evenings in the summer. For more information and a copy of our leaflet please go to your local library, GP surgery or council office or visit the Countryside Management Service Website. Thank you for sharing your experience via social media.